A Kansas man spent 25 years searching for the owner of a gravestone he found on a trailer. Finally just last month, he tracked the family down in Green Country, Oklahoma. "You kept it and it still looks just like it was brand new, 25 years ago," Rebecca Bell said. This group of four were strangers before Tuesday. Now between sips of coffee, they share a special story. "I feel like I'm about ready to explode actually," Don Busch said. Busch says it started in 1991 when he purchased a car trailer. 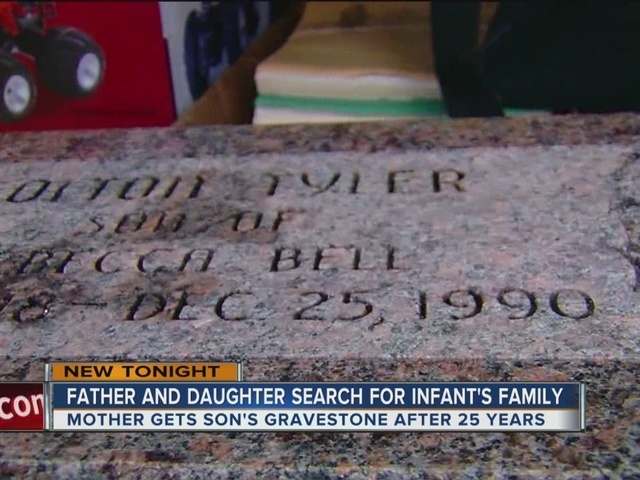 He said it came with an unexpected extra, an infant’s headstone with the name Colton Tyler Bell on it. "I kept it in the box for years," Busch said. "The box didn't last as long as the stone did." Busch said he and his daughter, Loretta, searched for years first flipping through phone books then using social media and ancestry.com. They had a shared goal, to get Colton back home. "I basically went through funeral homes and stuff like that," Busch said. On Halloween, Loretta came across a Facebook post that brought her to tears. It was from Colton's mother, Rebecca. "I got a text from my daughter-in-law, who said, 'Mom this person is looking for you,'" she said. "I took a chance and called that number." Rebecca said she lost little Colton to sudden infant death syndrome on the worst Christmas of her life. "We woke up Christmas morning to put the turkey on and he was blue," she said. Just two months after giving life to her little boy, they were buying a tombstone for his grave. "My mother had bought it when my son died in Wichita, Kansas and shortly after she had purchased it, the man passed away and so we just kind of let it at that," Bell said. The monument maker left the headstone on that trailer and set two families on a path toward each other. It would have been Colton's 27th birthday and this mother says she couldn't ask for a better Christmas present than this meeting. "I have a headstone, but now I have the original one and the original one I can put on the farm and I can sit and look at him everyday, and I do anyway, but now it's closure," Bell said.